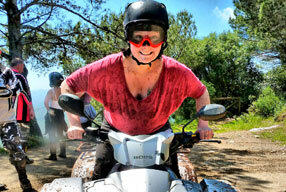 Quad Mountain Adventures in Marbella should be your first choice in the Costa del Sol if you want to experience the thrill of a Quad Bike tour in Marbella. It is an adventure and thrill you need to experience if you are visiting Marbella or other regions of the Costa del Sol for your holiday. We can cater for families, large groups, corporate and business team building events and also stag and hen parties. If you have never been Quad Biking before then you really do not know what you are missing out on. We bring you an experience and an adventure of a lifetime for you to share with your family and friends, making Quad biking in Marbella a great day out for everyone. For a day out in the Costa del Sol with a difference, we can provide an unforgettable adventure for people who want to experience Quad Tours in Marbella. We are located in the hills of Marbella at the foot of Sierra de las Nieves mountain ranges. As well as promising an adventure on Quad Bikes which you will never forget, you can experience the breath-taking country side along old tracks with river crossings and forest quad trails. 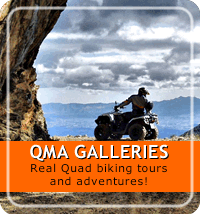 See our Quad Mountain Adventure Tour in Action! 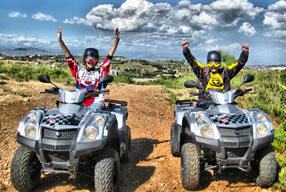 Our Quad tours don't end there - we can arrange ATV tours almost anywhere. The variety of trails, as well as our experience, makes it possible to suit any needs, whether you're a beginner or a long time quader. We provide a safe yet truly unique adventure, which allows you to enjoy nature, scenery and the hospitality of other quad biking / ATV enthusiasts. So for a truly alternative driving experience that will make you want to go out and buy your own quad bike, book a quad biking tour today and experience what it is like to get your hands on one of our Quad bikes. We provide everything from accommodation and quads, to help and safety guides. Our quad bikes are some of the best on the market, and are extremely reliable and simple to operate with them being fully automatic. 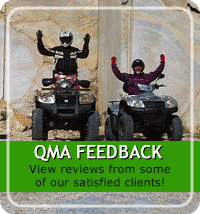 With over 25 years experience in off-road riding and driving, and our knowledge of the ever-improving quad trails. Quad Mountain Adventures guarantee an extremely reassuring Quad biking adventure for you and your party, so take that break from everyday life, COME RAIN OR SHINE! No previous experience is necessary to take part in our Quad Tours in Marbella, as all of our quads are very easy to handle. We will provide you with full guidance and tuition by experienced guides. 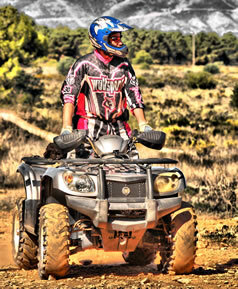 Our Quad Bike adventure is designed for anyone with a driving licence to enjoy. Thanks for a great day yesterday, it was excellent, we all really enjoyed ourselves. Messing about in the river was the best, the whole session was like nothing you would ever experience in the UK. It was obvious we were in the hands of professionals! It was absolutely fantastic - thanks to both of you for making it so much fun while keeping it safe. The photos are brilliant and I would (and will) recommend you to everyone. Jay has already planned his next trip with appropriate clothing this time! My t-shirt is now a duster - I have always thought I should have one! - and at the age of 19 Jay has finally learnt how to clean his boots. The photos are great - evidence that I did go through the mud! Thank you for the best day out we've had since we moved to Spain 6 years ago! We had a 2 hour trip with you last month which was great and thoroughly enjoyable; but today's longer tour was awesome with the amazing variety of terrain, the fantastic views from the heights of marble mountain and then the ride down to the river by track and road was all so exhilarating I'm still on a high! The quality of your quads and the care you take with safety before we leave your premises, as well as while we were out, all go to make the trip more enjoyable. Can't wait to see where you take us next time, because to be sure we'll be back very soon! Thanks again for a fantastic day out!